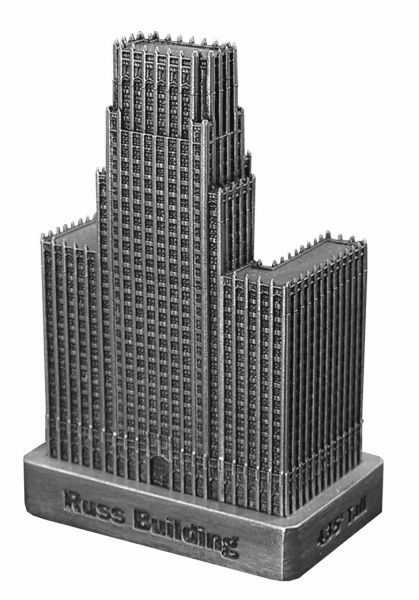 The Russ Building is located at 235 Montgomery Street in San Francisco and was completed in 1927. This building was designed by George W. Kelham and stands 435 feet tall with 31 floors. This pewter replica stands just over 3-1/4 inches tall and is finished in antique pewter. This model's scale is 1 inch = 150 feet. For more pics and info check out our blog. Surprisingly better when you get it. This building was surprisingly better when I opened it up out of the box. I actually like the back side of the building better. Pictures can only give certain angles. Good job!